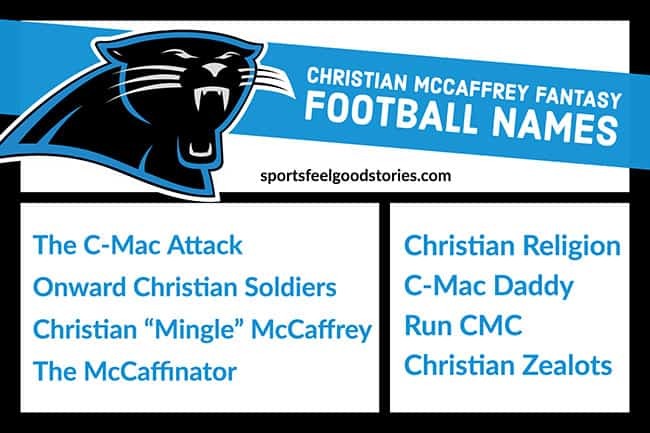 You’ll enjoy these creative Christian McCaffery Fantasy Football Names. While short of stature (5’ 11”), the all-purpose back displays the elusive play making abilities required in today’s offensive-minded NFL. McCaffery is a Stanford grad. His rookie debut in 2017 featured 435 rushing yards, 2 rushing touchdowns, 80 receptions, 651 receiving yards and 5 receiving touchdowns. He’s a force to be reckoned with on the football field. The Carolina Panthers drafted McCaffrey with the eighth pick in the first round of the 2017 NFL Draft. He was a finalist for NFL Rookie of the Year, finishing with 80 receptions and 651 receiving yards during his first season with the Panthers. In 2017, McCaffrey set team records for receptions, receiving yards and receiving touchdowns by a running back in a single season. He is the son of former NFL wide receiver Ed McCaffrey. Ed played for the Giants, 49ers and Broncos. Christian’s mom is former Stanford soccer star, Lisa McCaffrey. McCaffery played high school football at Valor Christian High School in Highlands Ranch, Colorado. As a versatile, multi-position player, he broke several Colorado high school career records. His records include: total touchdowns (141), all-purpose yards (8,845), touchdown receptions (47) and single-season all-purpose yards (3,032). After high school, he was honored as a 2014 U.S. Army All-American and attended Stanford University. His successful collegiate football career brought many honors: Heisman Finalist and AP Player of the Year in his sophomore season, two-time All-American and two-time All-Pac 12 honoree. McCaffery and his Stanford teammates capped off his final year with the team by beating the Iowa Hawkeyes in the 2016 Rose Bowl. You’re on Christian McCaffery Fantasy Football Names page. Enjoy!